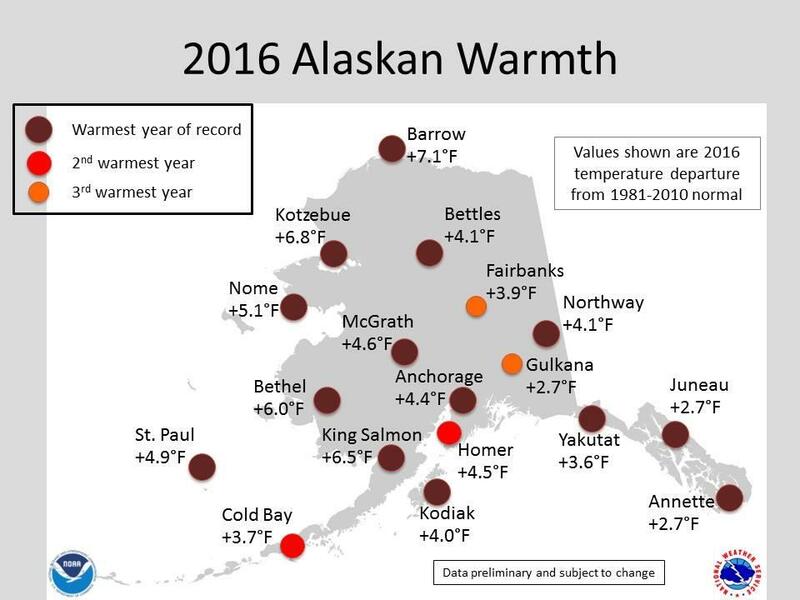 2016 was the warmest year on record statewide and in several communities, including Utqiagvik (formerly Barrow) and Kotzebue. The warmth contributed to several other records around the state, including the earliest breakup of the Yukon and Kuskokwim rivers in Circle and Bethel, respectively, and the earliest greenup, in Fairbanks. 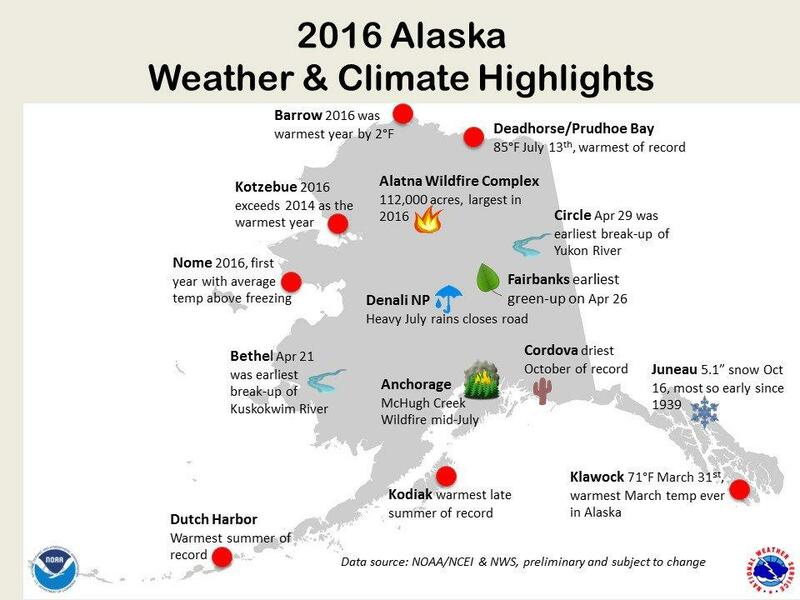 2016 was the warmest year in Alaska since the National Weather Service began keeping records in the state more than a century ago. Two weather-service climate specialists say that’s mainly because of extraordinarily warm ocean water, which in turn helped generate above-normal precipitation – especially in the Interior. The sun hasn’t risen in Utqiagvik since mid-November, but that didn’t keep the temperature from rising on New Year’s Day to above freezing. The high temperature in Alaska’s northernmost city, formerly known as Barrow, hit 36 degrees Fahrenheit on Jan. 1, reflecting in a way the extraordinarily warm year that had just ended. Warm-temperature records fell on most days in communities around the state dueing 2016. In the Pribilof Island community of St. Paul, warm-temperature records were set on 333 days last year. That’s a reference to the frequent above-normal temperatures that were recorded by weather stations around the state throughout the year. 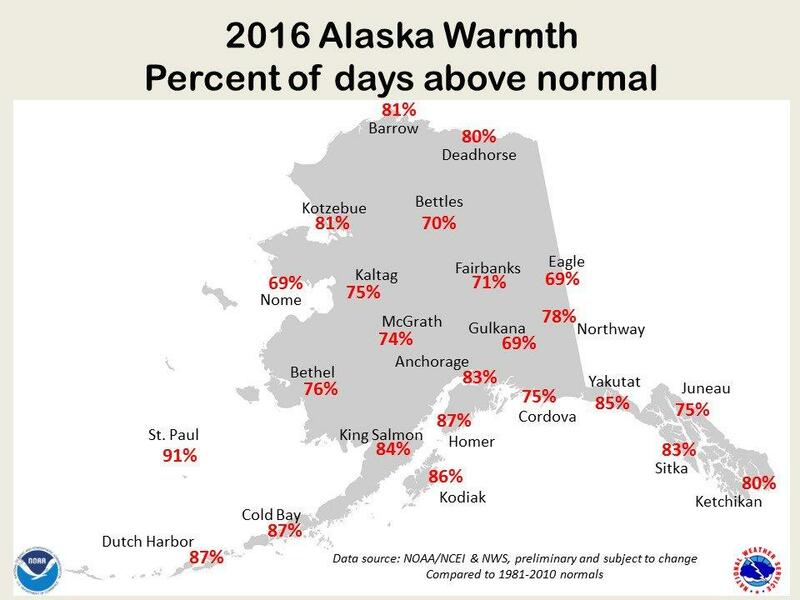 Anchorage climatologist Brian Brettschneider said the warm days just kept coming, day after day, with no appreciable cold snap during the winter, and relatively few days of what until recently would be considered normal, chilly winter weather. Brettschneider said 2016 blew past the previous record-setting warm year of 2015, which held the title for only a year after it had surpassed 2014. The National Weather Service said the warmth last winter was fueled largely by warm ocean water generated by El Nino and boosted by a separate phenomenon called The Blob, a term scientists used to describe an amorphous area of unusually warm water in the northern Pacific. Thoman said those two factors likely were the main reasons for numerous record-warm days along the coast. Brettscheider said a lack of any appreciable sea ice contributed to the warm temperatures. The weather service recorded a record high in Klawock near the end of March of 71 degrees. It said the unusually warm winter was followed by a warm spring, which contributed to a very early snow melt, river break-up and greenup. Warm air can carry more moisture than cool air. Brettscheider said that’s demonstrated by the amount of precipitation that fell around the state in 2016, especially in the Interior. That made 2016 the second-wettest year on record for Fairbanks. But Brettschneider said some areas, like the eastern Gulf of Alaska around Yakutat and parts of the southeastern panhandle were relatively dry. Statewide, the weather service said it was the 10th wettest year on record. Brettscheider predicted 2017 won’t be quite as warm nor wet. But he expected it will be, once again, a warmer and wetter-than-normal year.